Actually I have been slowly cleaning up my blog for the past weeks. I realised that many of my old blog posts were all misaligned. As you know, I lost my data twice within these 6 years of blogging and thus my recipe index was not in proper order. I guess it is also time for me to revisit some recipes that I enjoyed. mom's braised mushrooms. Mom's does it so well that even my new brother in law is using it as a bench mark for his new wife. Tough. So if you are a mushroom lover, I guarantee you that you will definitely love this dish. With the heavy diet we had the last few days, I think 斋菜 will be a good change for our palette. Okay now let’s continue to enjoy the bonding time with family and friends. I am submitting the above to Aspiring Bakers #15: Auspicious Dishes for CNY (January 2012) hosted by Wen of Wen's Delight. Put mushrooms and water and boil for 1 hour. Marinate oysters with light soya sauce and a few drops of oil. When the mushroom has softened, add oysters and spare ribs to mushroom stew after it has been cooked for 1/2 hour. Turned down heat to low and slowly simmer for an hour till spare rib has soften. Seasoned with oyster sauce and salt. Note: you can put in Fatt Choy only the last 5 mins of cooking. 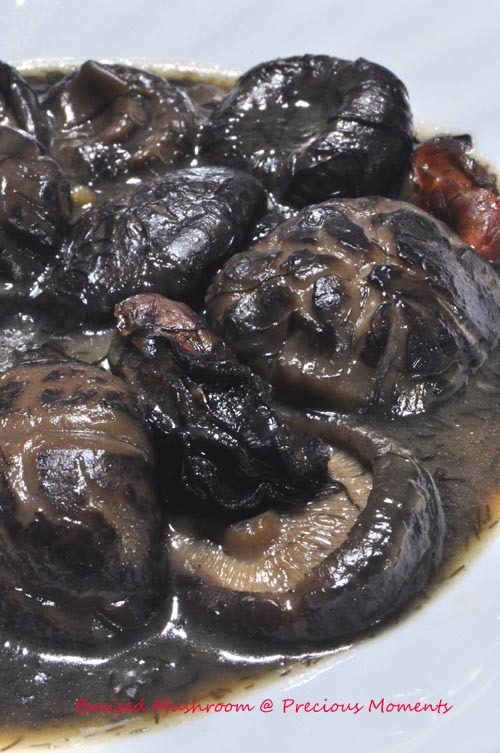 I love braised mushroom too. It's taste even better after a few days. Thanks for sharing!